The Canadian Handicrafts Guild-Manitoba Branch was instrumental in the initial recognition and marketing of Inuit art to southern audiences in the early 1950s. Twice a year, Inuit carvings were shipped to Winnipeg to be sold in the Guild Shop. The line-up for this sale usually stretched around the block! 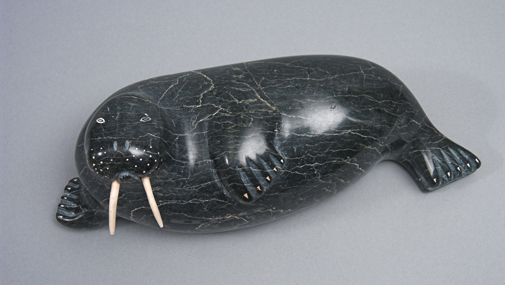 This walrus from Inukjuak is carved from serpentine, with tusks of ivory and soap inlay eyes.